PARKER has been creating pens that redefine writing for 125 years. When the PARKER Urban pen arrived for us to review, my husband quickly claimed it as his own and I barely was able to get a picture of it. I have not seen it since. When I asked him what he thought of the pen, he related this story to me. Hubs works on a busy construction site as the lead Superintendent. While showing his visiting boss around the site hubs assistant, who is an engineering student, needed a pen and made a grab for hubs new PARKER Urban pen. Hubs instinctively slapped the assistants hand and said “Not that pen!”. The assistant looked stunned as well as the visiting boss. Hubs’ boss took the pen and told the assistant, “When you graduate from Engineering and get your first big job, you too can have a beauty of a pen like this. THEN you will understand.” True story. Parker Urban Pen makes the perfect gift. Needless to say my husband loves this pen. The mix of style and ergonomics is a perfect balance. With Father’s Day just around the corner this pen would make a prefect gift. This pen would also make a great gift for any upcoming graduates. Where image is everything and quality is key, the Urban is an outstanding gift for men leading a modern life. For more information, visit www.parkerpen.com. Great news! 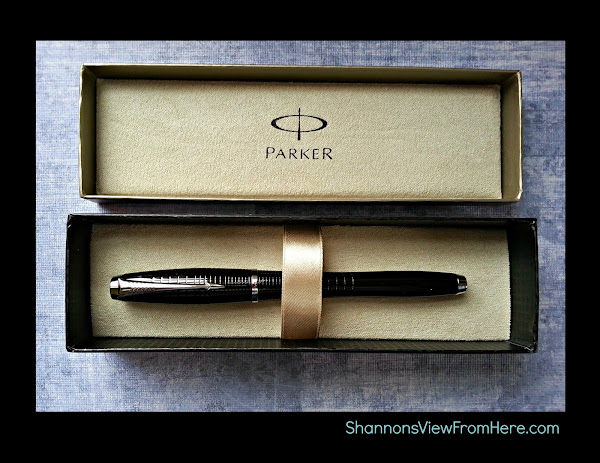 I have a PARKER Urban pen for one of you to WIN! Open to Canada only. My dad would get it, it would be perfect for his work! This would be a great gift for my step father. He works in an industry that requires him to sign a lot. I’m get to use it. My husband would get this. I would give this pen to my dad or one of my brothers. id keep it for my own use. I’d give it to my husband. A lovely gift! I would give this pen to my husband if I won. My daughter is going to university .. I would give it to her as a good luck/don’t forget your mom pen !! My hubby loves a nice pen so I would give it to him. I just pick up and then lose every pen I find! I would give this to my dad if I won. I would give this to my Dad is I won. My husband would get the pen it i won. I would let my husband have it…his job is way more professional than mine. I would give it to my husband, he’d love it! Thanks for hosting. I’d get it for myself. It’s gorgeous! I know this sounds selfish but I actually need a new pen. I would definately give this pen to my husband. He loves having a nice pen on him all the time. I might keep it for hubby and myself for our at home use.